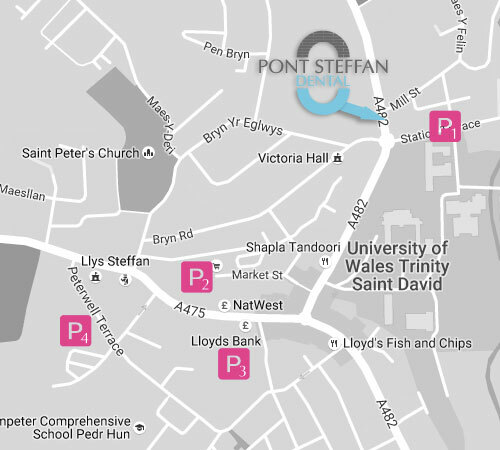 We understand that parking can be difficult for our location which is why we want to offer some advice on places to park in Lampeter. This is the closest place to park to the practice being just around the corner. It is free to park here but spaces may be very limited. Sainsbury's car park is a paid car park with 72 spaces available. It is 0.2 miles from the practice which on average is a 4-6 minute walk. Click here for directions to the practice from this car park. Cwmins car park is also a paid car park with 88 spaces available. It is 0.3 miles from the practice which on average is a 6-8 minute walk. Click here for directions to the practice from this car park. Rookery car park is paid car park with 104 spaces available. It is 0.4 miles from the practice which on average is an 8-10 minute walk. Click here for directions to the practice from this car park. "Professional kind caring staff that actually listen and work with you, first class advice and such a welcoming team." "As well as being extremely competent and well-organised, the staff are unfailingly kind and friendly." "Really friendly im petrified of the dentist but felt at ease there! Would recommend to anyone." If you have any problems please contact our Practice Manager. You can do this by calling us or using our Feedback Form and we'll get back to you. We have a complaints procedure that we use to ensure that complaints are resolved as quickly and easily as possible. In case of an emergency, please call the telephone number above and follow the answer phone instructions. Mewn argyfwng, ffoniwch y rhif ffôn uchod a dilynwch y cyfarwyddiadau peiriant ateb.